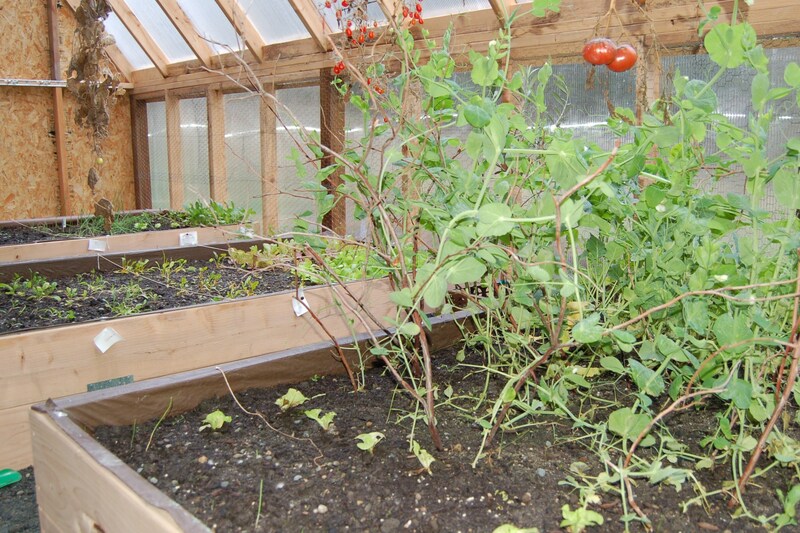 We finished building the main greenhouse structure and the beds within the greenhouse in early September. We didn’t actually finish the project, however, and likely won’t finish it until next spring or summer. First, we have some automatically opening vents we need to install. Second, we never finished setting up the heat sink system. This means that venting the greenhouse is really manual (opening up the front panels and door) and we don’t have any additional heat. So, this fall the greenhouse is pretty much like a giant cold frame. It is certainly a better climate in the greenhouse than outside, but I think it will be a better environment overall when we actually complete the project. That said, there are some interesting things going on in the greenhouse, even in its current state, as we head toward the end of November. Some are successes, and some are not, but I am learning a lot about how to grow in such an environment and expect that we’ll be able to make increasingly better and more efficient use of the structure in the future. I’ll start with a success. This is the only pepper plant I planted last summer and I am still getting peppers off the plant. Growth has of course slowed, but the peppers continue to redden. I plan to plant a whole lot more peppers next year and will probably dedicate six hanging planters to peppers alone. 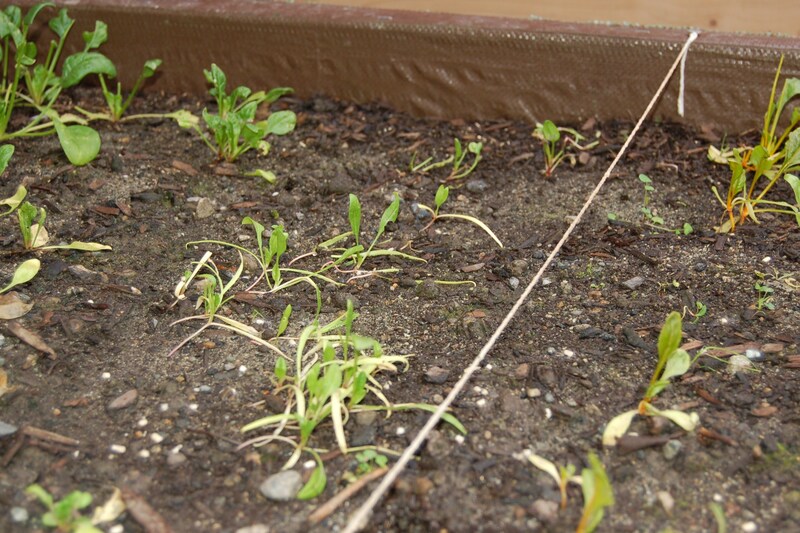 Our lettuce plants are also doing well, though growth has slowed. Next, I have a failure. The cabbage (and broccoli) that I planted has had two major problems. First, it was planted too late. It probably needed to go into the ground a full month earlier than it did. Second, the plants have had serious insect problems. I did find a few green caterpillars, which I pulled off and destroyed. I also found aphids (or something similar) on the backs of some leaves. I first tried spraying the plants with an organic insectide. The problem continued so I tried mixing up a potion from the Terrific Garden Tonics book. Neither worked. 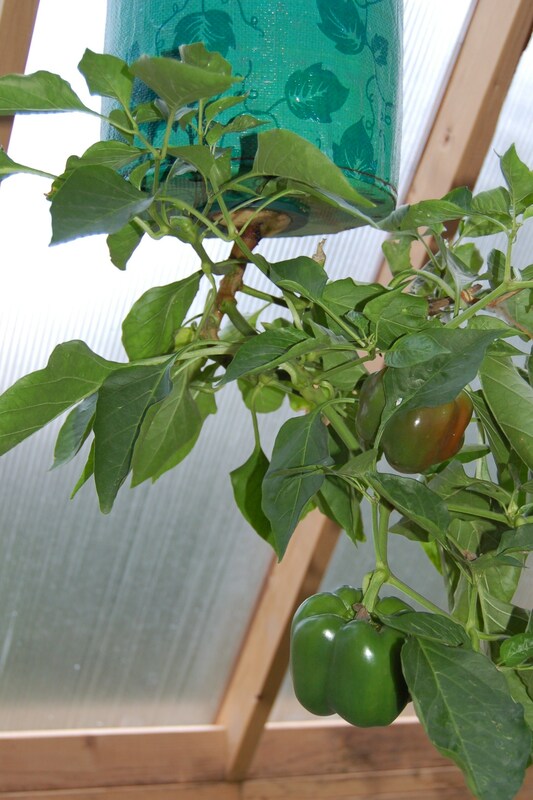 Then I started thinking that maybe rodents were nibbling away as well, so I put a mouse trap in the greenhouse. I’m not even sure if mice would do this, but nothing I’ve tried so far has worked. Haven’t caught a mouse yet and the damage continues. The same two problems (late planting and insects) have been factors in the problems I’ve had with the spinach and chard as well. They both sprouted nicely but then growth slowed significantly as the days shortened. Plus, the growth there is keeps getting nibbled away by insects. 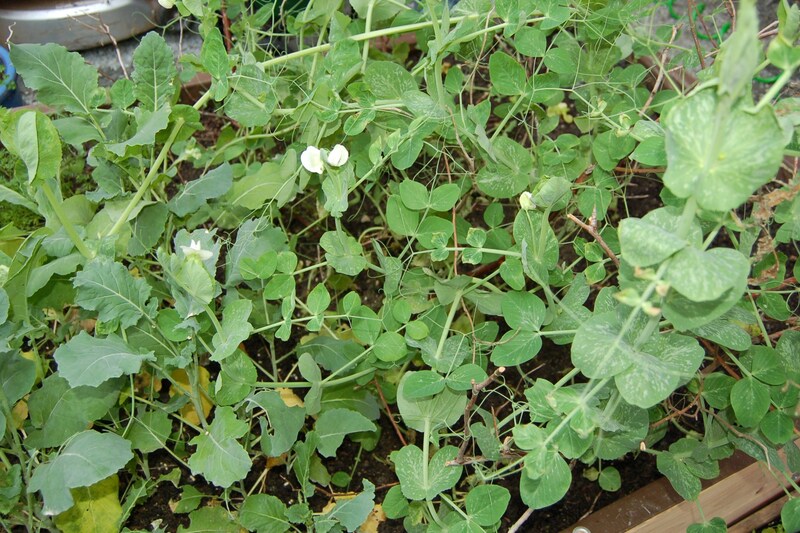 Neither a failure or success, next I have the Oregon Giant pea plants. The plants are nice and large in size and they are flowering, but I have no idea if we’ll actually get pea pods. At this rate, the pods wouldn’t actually be formed until we’re into December, and I’m thinking that doesn’t sound too likely. Next, an experiment. While looking for a winter greens crop, I kept running across mache. I don’t believe I’ve ever actually eaten mache, but it is supposed to do well during cold months and the description sounds nice, so I thought I’d give it a try. 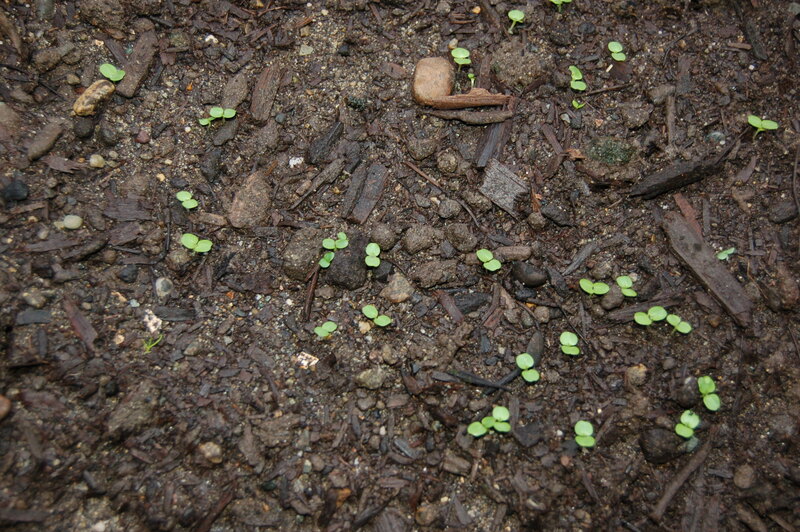 The first week in November I planted some seeds in the greenhouse and some outside. Those outside haven’t even germinated yet. This entry was posted in Gardening and tagged cabbage, chard, greenhouse, grow lights, lettuce, mache, peas, peppers, spinach. Bookmark the permalink. Very interesting. I’ll have to look up those LED grow lights. Do they flicker at all? I bought some Christmas lights and the slight flicker gave me a headache. I don’t see any flickering at all. The only drawback I see is that the lights look so cool I can’t keep my kids away from them. Luckily, the lights don’t get hot so I don’t need to worry about burns. Thanks, we don’t have kids (only cats & dogs) so I wouldn’t have to worry about that (although my cats like to eat my seedlings). I’ll definitely be looking into LED grow light! The greenhouse project looks spectacular. Well done. On your cabbages, the culprit critter is cabbage worms. 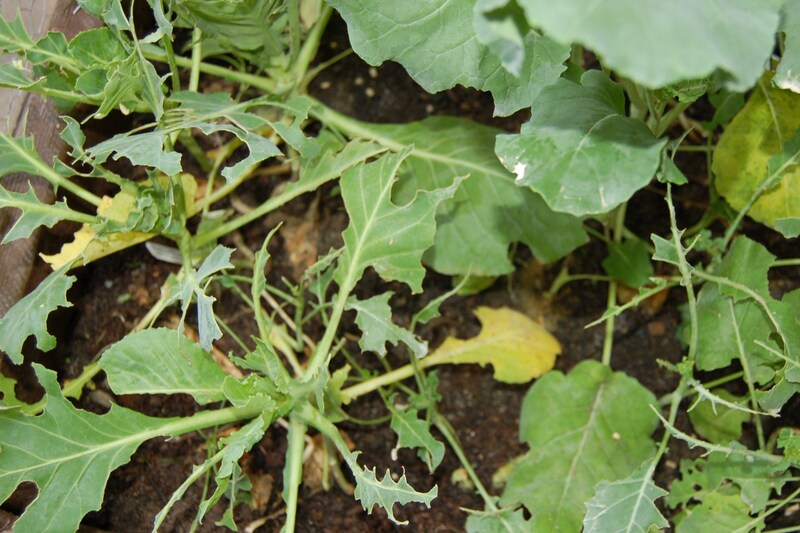 Those white moths that flutter around the garden in summer and early fall lay eggs and the caterpillars are bad news for cabbages, broccoli, and other cole crops. The best solution is to spray about every 14 days during the summer and into the early fall with a dilution of Bacillus Thuringiensis, commonly known as Bt. This is a a naturally occurring bacteria that is deadly to cabbage worms. Once they consume a part of a plant treated with Bt, the worm stops feeding and shortly thereafter dies. It really works. I would not try to grow broccoli, brussel sprouts, or cabbage without it. Here is a link to a good web page discussing these worms and BT. Finally, just wanted to comment on the mache. I love this little plant and grow a large patch of it every winter. I have some growing right now that will be ready for first harvest in December. It almost has a buttery taste to it and makes a lovely salad or a great “lettuce” for tacos etc in the dead of winter when all the other greens have succumbed to the heavy rains and cold. Because it grows in a rosette and close to the soil – you have to be a little careful when cutting for harvest not to get too much soil mixed in with the small leaves which makes the rinsing/cleaning a little harder. Hope you get a good harvest from them. 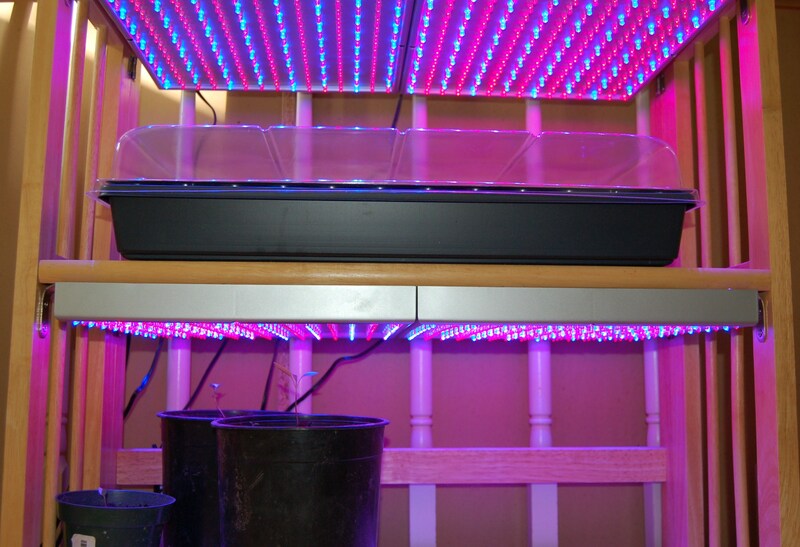 Please keep us updated on the LED grow lights. I just got my camera problem fixed (old camera died on me last week) so I will try to post pics of my seedlings tomorrow (Sunday) and give a short update on them in my blog. I suspected cabbage worms and did use a spray with BT. Not sure if I didn’t spray enough or what, but the destruction continued. It was a mixed spray, however, so maybe the BT wasn’t strong enough. I’ll definitely let you know how the lights work out. I’ve never used grow lights before so I don’t have a reference point for their effectiveness, but I’ll certainly let you know how my seedlings do. Your lettuce is looking really good and the peppers too. The leaf damage is from the green caterpillars, they come from those small white butterfly’s. The best thing to kill them is BT, it is a bacteria that kills caterpillars but does not harm humans, pets etc and it is organic. 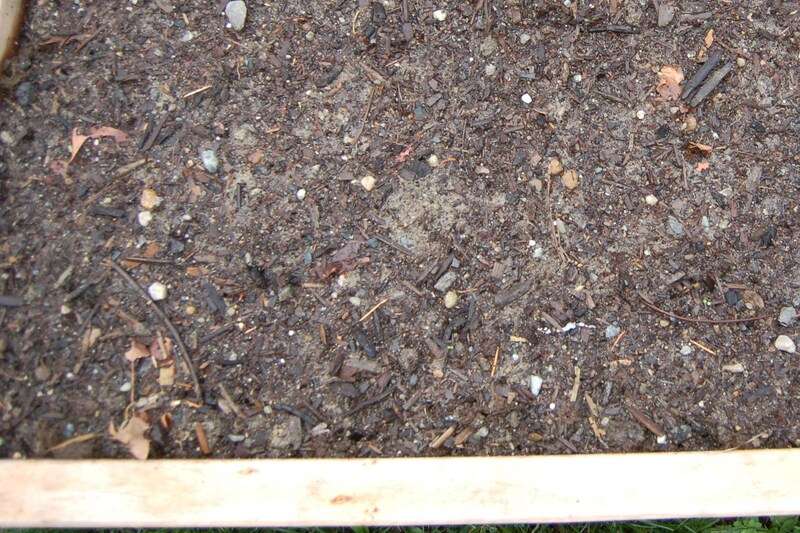 Our Engineered Garden just did a post about it that is very informative. That is one interesting grow light you have, I will look forward to watching your progress with it, seems like a really good idea. My light is 400watts, it would save a lot of power if I could use a system like yours. Thanks for the feedback Dan! I think I’m going to need to get a straight BT spray instead of the mix I bought which contained some BT. There are tons of these LED grow lights on BT. I’ll let folks know how they work out for me. Any ideas, anyone, whether the cabbage worms would also eat my spinach and chard? I’m pretty sure the cabbage worms would eat those plants as well. However, I can’t back up my statement with any good evidence. I did want to mention that I just noticed aphids on my mustard greens as well! I have never had such a thing happen before and was attributing it to my warmer weather. I’m going to have to check on the cause. There wasn’t any real damage to the leaves, I just had to wash them an extra bit to assure myself all the aphids were gone before we ate the leaves!! Murphy’s oil soap works well to rid plants of aphids. Or, get some lovely ladbybugs for your greenhouse. Well, thanks for letting me leave such a long comment on my first visit. It would be best to mix your own BT and it should be applied on a regular basis to keep them at bay. From what I can gather BT is almost like salmonella to humans so it would have to be all over the plants on a regular basis to work. 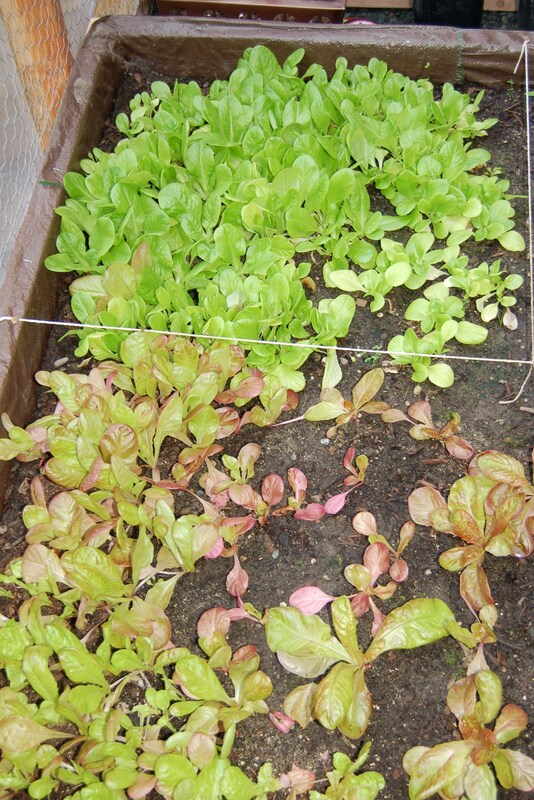 The spinach & chard could be from the cabbage worms but I think they prefer brassica’s over any other plant. Slugs may be eating these plants. They are pesky things to control as they hide really well, any small slim trails? Dan, I thought of slugs too and spread some Worry Free slug pellets around. The spinach and chard plants are still being chewed . . .
And I too love the sci-fi grow lights. You can’t grow Tribbles that way, hehe. I am also interested in those results. Gardened for twenty years now, every year, a new learning experience. Always plant with the idea that your losses are going to be unexpected, and at about 30% and accept it! Mother Nature is the boss, and we just work around her wishes! With these small failures you have likely come to the conclusion that gardening requires constant knowledge gathering, is an art form, and the average American will not survive on food from his first few years of depending on a garden due to lack of hand-me-down information, lost a few generations ago – what a great loss! We. once fed ourselves from back yard gardens, and now our very survival depends on factory farms, and foreign imports! We are so vulnerable! A small shift in the dollar, and whammo! starvation in America, once, the farmland to the world! We have lost too much! We need to build our own cars and grow our own food at home in the back yards, and let the corporate vultures go their way! Introducing the world’s first 5 spectrum hybrid led grow panel, the ISIS family of LED grow lights. What to do with 200 pounds of plums?